Settling quickly Falkirk got the better of the early exchanges, and they were promptly rewarded when Scrum-Half Fionn Call converted a penalty in the sixth minute. Almost immediately afterwards good interplay between Number Eight Stewart McCulloch and Fionn Call on Accies ten metre line led to the ball being fed to the back division,with Full-Back Connor Faulds timing his run to perfection before sending his brother Glen away at pace on the right wing,as he outpaced Accies defenders for a splendidly taken team try, which Call slotted between the uprights. However the Glaswegians hit back,just five minutes later, when they threatened to breach Falkirk’s try-line and the home side’s Inside-Centre Simon Rolleston was Yellow-Carded for a high tackle,and as a result the Referee awarded the visitors a penalty try. 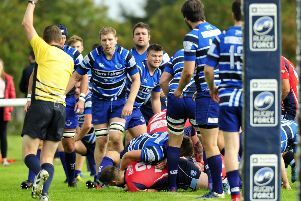 In a keenly contested encounter both sides seemed to cancel one another out and the only other score of the half came from a 37th minute penalty from Call for a half time score of Falkirk 13 Glasgow Accies 7. 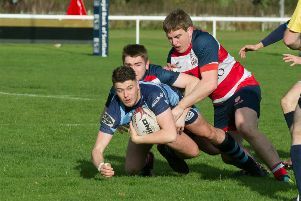 Following an opening ten minute spell of honours even Accies burst into life in the 52nd minute when Falkirk lost control as they attempted to run the ball from their own 22 metre line, and after several rucks on Falkirk’s five metre line, Jack Macready crashed over in the corner for an unconverted try. Responding positively and forcefully Falkirk retaliated when their pack of forwards worked their socks off on Accies five metre line for a Simon Rolleston try on the hour mark,which Call presently converted. However Accies were having none of it as Outside-Centre Erland Oag exposed some weak Falkirk tackling by jinking his way through for a try in the corner in the 72nd minute,and Stand-Off Cammy Wray set up a tense closing spell by converting accurately from the touchline. To their own and the home supporters relief they hung on to the welcome sound of the Referee’s closing whistle.